Students from around the world find a home at Hamline University. We are defined by our values of social justice, inclusive leadership, and global service. The current undergraduate class comes from 35 states and 39 countries. 25% of Hamline students are multicultural. 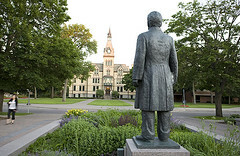 Founded in 1854, Hamline University is a small school, nestled squarely in the middle of the two largest cities in Minnesota, Saint Paul and Minneapolis. Offering undergraduate and programs in education, business, and the liberal arts, Hamline graduates 500 students each year who gain practical skills and real-world experiences. 100% of students complete an internship, collaborative or field-based research, or service-learning project. Download a copy of an international undergraduate information brochure about Hamline here. Discover how Hamline University can help you take the lead with a college experience like no other. View our international scholarship page to see what you can apply for. Our International Admission Counselor can answer your questions. Follow the instructions in our International Application Guide to successfully submit your application to Hamline University. Learn more about applying for a student visa, and traveling to Hamline. Hear from international students who decided Hamline was the right place to pursue their education and career goals. Questions about the admission process? Contact the undergraduate admission office at admission@hamline.edu. Questions about obtaining your visa, housing, and traveling to the US? Contact the Global Engagement Center at gec@hamline.edu.